As a 2014 officer for Portland Modern Quilt Guild I had the opportunity to work and collaborate with a bunch of amazing people. My fellow officers were awesome and I am happy to call them friends. 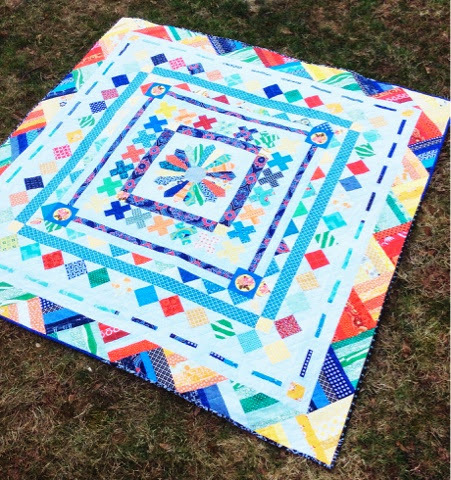 One of the coolest things we did for the guild this year was to design a medallion quilt for an alternative to a block of the month program. 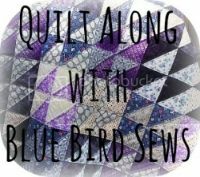 It worked really well and we have almost 20 finished quilts hung up at our December party and I know there are more out there to be finished in 2015. I'm gonna be honest here, if I wasn't an officer I probably wouldn't have taken this project on, but I am so happy that I did! The pace was just perfect with just one new boarder each month and I started it with the intention of it being just for me so I chose fabrics that were my favorite. 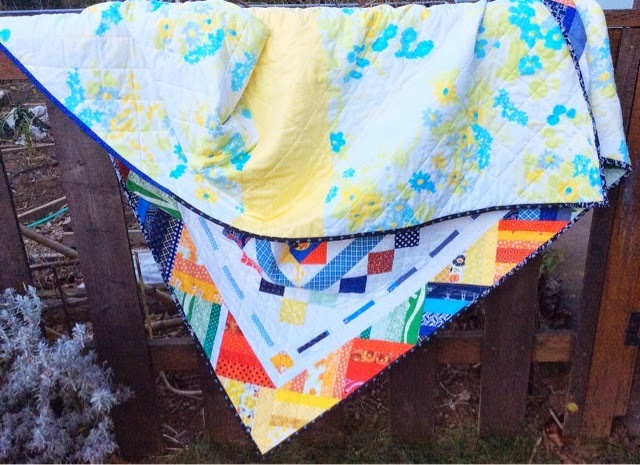 Making this quilt throughout the year taught me so much about my own personal quilting style. I am now 100% sure about the colors that speak to me and patterns I'm drawn to. 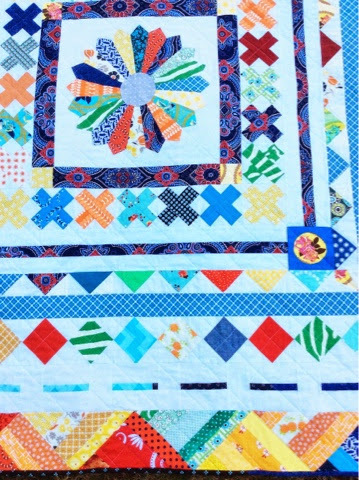 There are my favorite vintage fabrics in there and lots of DS Quilts; this quilt is so much me and I love it. To finish I straight-line-quilted it with an all over grid 2" apart on the diagonals. And thanks to precise piecing lines match up! I backed it with a vintage sheet and a line of yellow gingham to bring it up to size. This is the first quilt to be able to live on our bed but for bittersweet reasons. Our kitty of 14 years passed away over Christmas. I was unable to put a quilt on the bed because she would claw things. 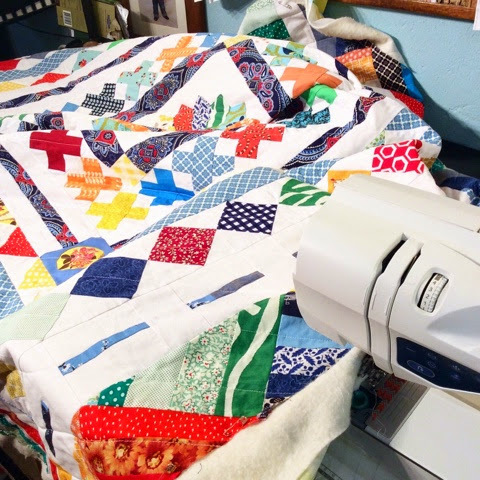 It was in her final days I finished the binding and put the quilt on our bed. I know, sad face. 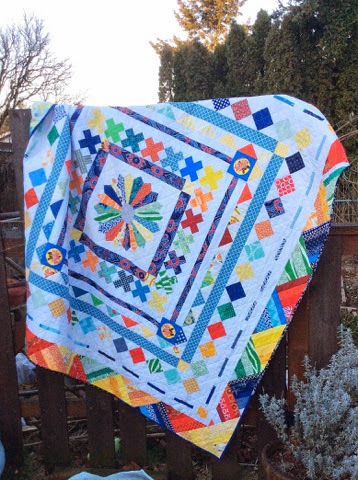 My final quilt of 2014 turned out to be my best quilt ever and set me up nicely for 2015. Happy New Year! So, so sorry about the loss of your cat. And congrats on finishing your Medallion! I know I love mine. The medallion looks good! I like the way you arranged the colors. We lost our dog just before Christmas, so my heart goes out to you. Maybe having a quilt you love on your bed now is a bit of comfort just when you need it. It is truly lovely.